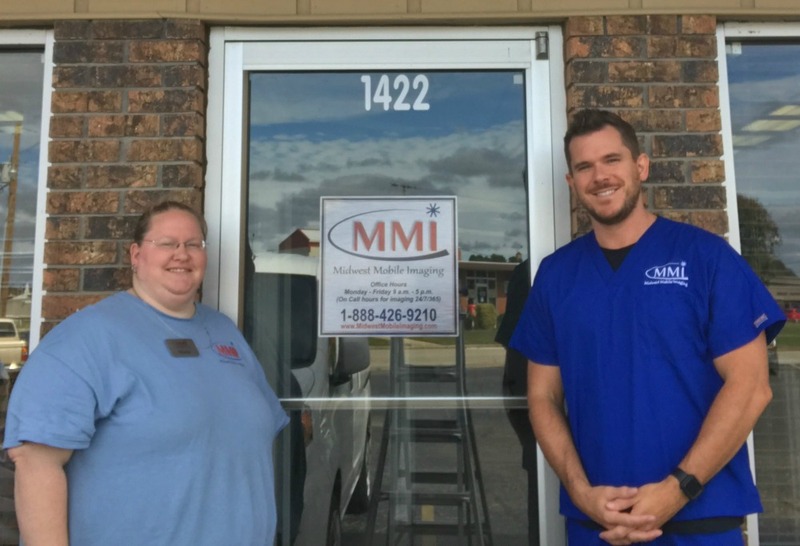 [WEST PLAINS, MO] Midwest Mobile Imaging (MMI) is the most recent business to graduate from the Ozarks Small Business Incubator program. MMI was founded in April 2013 by Dan Taylor. They provide mobile x-ray and ultrasound services to long-term care facilities and residential homes. Dan started the business at OzSBI to take advantage of the all-inclusive program of rent, utilities, internet access, phone service and other services. But he got more than he inspected. Most importantly he received help from a team of mentors. They worked with him diligently to overcome some of the unique barriers MMI faced as a startup company. The biggest challenge Dan faced during his first year and half was obtaining a Medicare number so he could bill for his services. OzSBI worked with United States Representative Jason Smith’s office and his local representative Heather Peugh to overcome Medicare’s initial decision that MMI did not qualify. OzSBI advocated at the state and federal level, spearheading letter writing campaigns and presenting a case to Medicare that this business would provide mobile imaging services in a medically underserved region of Missouri. The only similar provider was over 100 miles away in Springfield. After graduating as a radiologic technologist from Pima Medical Institute of Arizona and working for a mobile imaging business in Phoenix for 2 years, Dan recognized the need for similar service in his hometown of West Plains. To start his business, Dan wrote a business plan and signed up to use OzSBI’s shared office space. Once he sold his home in Phoenix, he returned to West Plains and rented a small office at OzSBI and applied for and received an OzSBI Microloan to purchase his x-ray equipment and mobile van. He gained his first nursing home contract and was awaiting Medicare approval, when the business screeched to a halt. Medicare did not feel there was a demonstrated need for a local mobile imaging service. Since then Midwest Mobile Imaging has continued to experience sustained growth. Dan now employs three full-time, one part-time and three on call PRNs. He has purchased a second van, an ultrasound machine and an additional x-ray machine. His mentors also added value by introducing Dan to business leaders in the industry he was working with by advocating for him to be a local provider of services. It all paid off when Dan was able to secure 5 additional nursing facility contracts. MMI now covers an area from West Plains to Ozark, MO. When asked how OzSBI helped his business, Dan replied, “OzSBI mentors helped tremendously in brainstorming new ideas, finding different approaches to issues at hand, helping pull together financial outlines and business plans and working on different ways to contact and get in touch with people in the community who were able to help.” OzSBI definitely accelerated Midwest Mobile Imaging’s growth during his stay. After two and half years at OzSBI, MMI had outgrown its office. The company’s finances were stable, the management team was in place, and it was time for MMI to launch from the incubator program. Heather Fisher commented, “It is always bittersweet when a company graduates. We are very involved mentoring and advising companies during their infancy, but once they reach the place where they can run successfully on their own, it is time to graduate them from the program. Their success is our success. It leaves behind an empty space in our facility. But it also gives us an opportunity to work with another company.” OzSBI has available office space from 125 to 1800 square feet.